Insulating a dirt crawl space can reduce your heating bill and keep your home’s floors warmer in winter. However, it is more complicated than other energy-saving projects, such as blowing loose fill insulation into an attic or even stapling on insulation behind drywall. Before insulating under the house, you should block incoming moisture, seal the floor, and mitigate radon. 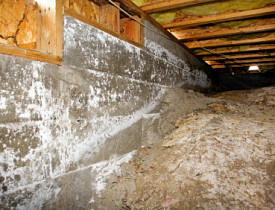 Once the crawl space has been prepared, you will need to carefully insulate the walls or subfloor. Radon ventilation. Before starting with insulation, make sure to vent the radon lurking under your house. Radon is an invisible carcinogenic gas, which can seep from the underlying soil into nearly any home. To keep this dangerous gas out, install a radon ventilation pump underneath the house, then cover the dirt with a thick plastic barrier to seal off the crawl space and help mitigate moisture. The barrier should cover the entire floor and at least the first six inches of the wall, and all seams should overlap by one foot to prevent any gaps and leaks. Moisture exclusion. Moisture can rot the wood in your home, foster mold growth which causes health problems, and reduce the effectiveness of insulation work. To keep moisture out of the crawl space, slope all your landscaping downward, away from the house, and extend gutter downspouts so that drainage doesn’t contact the foundation. With proper moisture control in place, you can then close any vents and maintain a sealed crawl space that will keep temperatures better regulated than an openly ventilated crawl space. Insulate foundation wall vs subfloor. The other advantage of a sealed crawl space is that it enables you to save money and materials by insulating the foundation walls instead of trying to attach insulation below every section of the subfloor. It takes far less insulation to cover a perimeter of 3-foot walls than to cover the entire floor. Wall insulation also will automatically keep the ducts and pipes from freezing or losing too much heat. Insulation material. Insulate both the masonry foundation wall and the joists with rigid foam board insulation, closed-cell foam spray, or batts. In a dry climate with adequate moisture control, fiberglass batts will work. However, they might attract mold, and will become less effective if they get wet. To be safe in damp climates, use solid foam alternatives. Insulate access opening. You also need to insulate around your access opening to ensure an airtight, energy-efficient crawl space. Check for a solid termite shield between the wood band joist and the masonry wall. If there is no shield, leave a gap in the insulation so that you can inspect for future termite damage. Next, check for gaps under the house, such as around plumbing fixtures or wiring, and seal them with caulk or spray-foam insulation. Then, if you choose to maintain a ventilated crawl space, tightly affix batts with a vapor-retardant facing. Be sure not to leave any holes between batts or gaps above the batts and below the subfloor. Add insulation hangers, thick wires that bend into place and hold the insulation batts, every foot or so. Insulating a crawl space takes a little bit of work, but the effort should pay off in comfort underfoot and lower energy bills. Do it yourself or hire an experienced contractor to get this important home improvement done.